Background: Aflatoxin B1 (AFB1) is the most potent mycotoxin of A. parasiticus and is considered as a group I carcinogen for humans. AFB1 causes detrimental health effects on human and domestic animal. AFB1 is basically blamed for their acute toxicity that responsible for severe hepatic cancer and other metabolic disturbances. Polyketide synthase (PKS) enzyme lays the foundation of the biosynthesis of the carcinogenic secondary metabolite aflatoxin B1 in Aspergillus parasiticus. The PKS contains a product template (PT) domain that controls the specific aldol cyclization and aromatization of the polyketide precursor which further leads to aflatoxin B1 biosynthesis. Methodology: In his investigation we docked the different types of ligands that are interact with PT domain of PKS that restrict the aflatoxin biosynthesis. Result: The computational molecular level interaction has discovered that there is presence of inhibition of different compounds such as amentoflavone, 6,6-bigenkwanin, 5,7-dihydroxychromone, ferulic acid, gallic acid and vanillic acid, into the active site of the protein which competitively bind to its substrate binding residues. 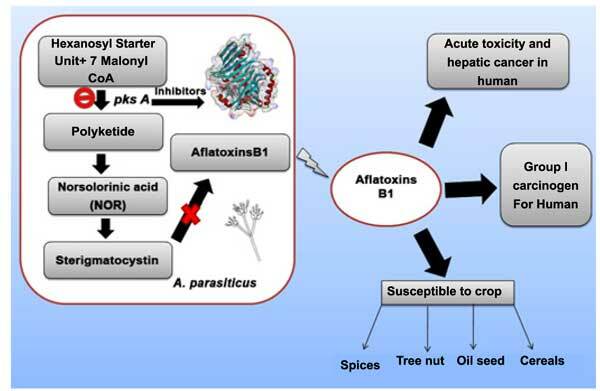 Successful inhibition would lead to the formulations that can be used to control aflatoxin contamination of agriculture crop yields and poisoning. Keywords: Product template, polyketide, carcinogenic, aflatoxin B1, docking, enzyme. Keywords:Product template, polyketide, carcinogenic, aflatoxin B1, docking, enzyme. Abstract:Background: Aflatoxin B1 (AFB1) is the most potent mycotoxin of A. parasiticus and is considered as a group I carcinogen for humans. AFB1 causes detrimental health effects on human and domestic animal. AFB1 is basically blamed for their acute toxicity that responsible for severe hepatic cancer and other metabolic disturbances. Polyketide synthase (PKS) enzyme lays the foundation of the biosynthesis of the carcinogenic secondary metabolite aflatoxin B1 in Aspergillus parasiticus. The PKS contains a product template (PT) domain that controls the specific aldol cyclization and aromatization of the polyketide precursor which further leads to aflatoxin B1 biosynthesis.